A lively, step-by-step approach to training the trainers of adults. Using numerous examples from a variety of settings, author Jane Vella compels instructors to critically examine their old teaching model and discover a new experience in education. JANE VELLA is president of Jubilee Popular Education Center in Raleigh, North Carolina, and adjunct professor at the School of Public Health, University of North Carolina, Chapel Hill. She is the author of Learning to Listen, Learning to Teach (Jossey-Bass, 1994). Vella has designed and led community education and staff development programs in more than forty countries around the world. Part One: Training That Respects the Learner. 1. Teaching Adults: Insights from Popular Education. 2. Training Trainers in the Popular Education Approach: One Model. Part Two: Lessons Learned from Practice. 3. Group Size and the Role of the "Professor": Training Trainers in Community Health. 4. The Importance of Dialogue: Training in Nonprofit Organizations. 5. Honoring the Role of the Learner: Training with Health Professionals. 6. Transforming the Culture of Teaching: Training in Literacy Programs. 7. Rebuilding Faith in Teaching: Training in a Substance Abuse Program. 8. Making Time for Training: A Community Development Bank Invests in Learning. Part Three: Applying the Approach. 9. The Challenge of Design: Developing a Program for Community Volunteers. 10. 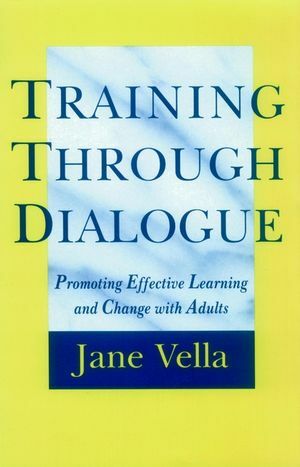 Supporting Newly Trained Trainers: Strategies for Continuing Dialogue. 11. Evaluation: Beginning to Assess the Results. Resource: Glossary of Popular Education Terms. www.janevella.com Visit Jane Vella's web site.